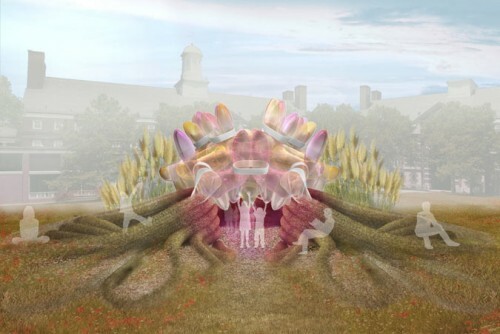 Coming this summer to a Governor's Island near you (as long as you're in New York), the Burple Bup pavilion will fuse natural and synthetic materials to create a sustainable refuge from the sun. Composed of layered earthen strands winding sinuously beneath a translucent floating dome. Designed by Bittertang, the temporary shelter will provide a quiet meditative and social space on the island beginning May 27. Burple Bup is described by its designers as a secret hideout that promotes quiet socializing, the space will also provide a venue for arts and cultural performances. Earthen berms made of fabric tubes filled with bark and soil wind naturally to form a new landscape and sound barrier. Grasses will cover the berms to create a lush landscape suited for relaxation. Individual inflated balloons called "Bups" join together to create a hovering ceiling that filters light with a changing wash of color. 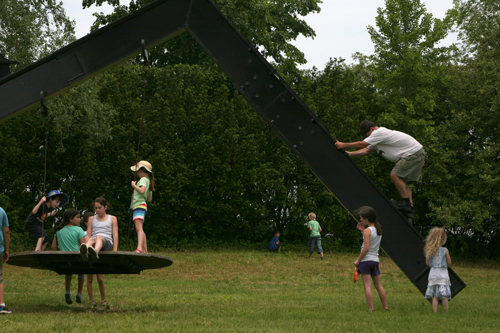 After the summer season is finished, the shelter will be disassembled and either recycled or reused. The fabric and soil from the berms will be composted and used for nearby landscaping projects while the inflatable Bups will be distributed to local swimming pools for use as toys during summer 2012. Bittertang's concept was selected from over 80 entries to the City of Dreams Pavilion Competition sponsored by Figment, the Emerging New York Architect Committee of the AIANY, and the Structural Engineers Association of New York. Construction will begin soon, pending approvals and fundraising. (You can donate to the project over here.) The pavilion will be open to the public from May 27 through September 25 and an exhibition of the design will be on display at the Center for Architecture at 536 La Guardia Place from July 18 through September 16.